The Honeoye Falls - Town of Mendon Historical Society is dedicated to the preservation of local history and the education of the community. The Society operates a museum located at One Harry Allen Park, which is open to the public Sunday afternoons from 2 to 4. 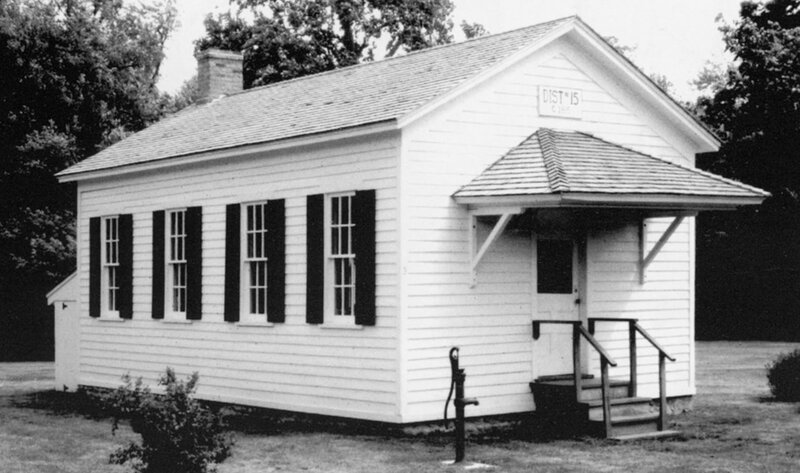 Both the museum and one-room schoolhouse (pictured above) provide educational programs to first and fourth grade classes from the HF-L School District as well as other local districts. The Society conducts eight educational meetings, held at the Mendon Community Center, each year (open to the public) and co-sponsors the annual Festival-on-the-Green. The Society also sponsors an annual Christmas social at the schoolhouse. The Society was chartered by the New York State Education Department on July 28, 1961 and is classified by the IRS as a 501(c)(3) public charity. Donations to the Society are tax-deductible. For a complete listing of our 2019 programs, please view our 2019 Program and Membership Brochure as a downloadable and printable PDF. In addition, a handy, single iCalendar file that will populate your e-calendars (Outlook, Gmail, mobile phone, tablet, etc.) with all ten 2019 programs automatically. The 2019 President's Letter is also available for download. The May 2, 2019 meeting of the Honeoye Falls - Mendon Historical Society will feature a presentation by local author Patrick Byrnes. Patrick's topic will be "Jogging Through Cemeteries." Jogging Through Cemeteries is Patrick Byrne's first published book, which deals with the special ways in which we all grieve. In “Jogging Through Cemeteries,” Patrick takes the reader on a journey as he jogs through local cemeteries in the Rochester, NY area, stopping to talk and interview people mourning lost family and friends. “Jogging Through Cemeteries” gives an insight as to how we all deal, in our own way, with grief. Read along as mothers, fathers, brothers and sisters let their emotions out to a total stranger running in the graveyard. Patrick Byrnes is a lifelong resident of the Rochester, NY area. The meeting will be held at 7:30 PM on Thursday, May 2nd at the Mendon Community Center, 167 North Main Street, Honeoye Falls. This facility is handicapped accessible. The meeting is open to the public. For information call 624-5655. The April 4, 2019 meeting of the Honeoye Falls - Mendon Historical Society featured a special presentation and demonstration by our very own Sarah LeCount: "The Fabric of History: Five Key Textiles from the HF-M Historical Society Museum Collection." This special presentation has been archived for posterity. You may view it on our YouTube channel. The museum is located in an historical building - namely the carriage barn of the Wilcox House, an early hotel at the four corners of Honeoye Falls. The museum has an excellent display of Indian artifacts dating from the Lomoka Period (2500 BC) through the Iroquois Period when the Seneca inhabited this area. Pioneer days of Honeoye Falls through the present day are well documented depicting the lifestyles of the times since 1791. Open Sundays, 2:00 PM - 4:00 PM. Open other times by appointment.